This blog has been dark for the last several weeks because I’ve been working furiously on a raft of Summer 2013 releases, among them the long-awaited Blood ‘n’ Thunder Guide to Pulp Fiction — which, I’m happy to report, is now available. This new Guide is a considerably revised and expanded version of the Blood ‘n’ Thunder Guide to Collecting Pulps, which was published in 2007. With the dimensions of a vintage pulp (seven by ten inches), the earlier book had 226 pages. This one has 414 pages. 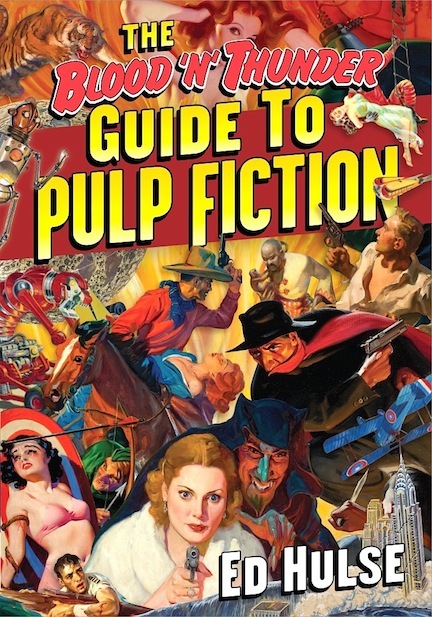 The first Guide reproduced nearly 400 pulp covers. This one has approximately 700, and also uses a smattering of original pulp paintings as chapter-opening illustrations. In addition to significantly reworking and beefing up copy in the old Guide, I’ve added all-new chapters on genres that weren’t covered in the 2007 book: War/Aviation, Sports, Romance, and Spicy/girlie pulps. The earlier tome’s emphasis on collecting vintage magazines has been toned down for newer fans who just want to read the stuff. As an aid to them I’ve created two new appendices; one offers basic information on the various small-press publishers who specialize in pulp-story reprints, the other lists must-have pulp anthologies both in and out of print. Although the Blood ‘n’ Thunder Guide to Pulp Fiction is available now as a standalone item, I’m also offering the book at a discounted rate to those who purchase it with a subscription to Blood ‘n’ Thunder. The book’s cover price is $29.95 (shipping included to domestic U.S. buyers) and individual copies of the magazine sell for $11.95. But a four-issue subscription costs just $40, and I’m selling the Guide at a 20 percent discount (which brings its cost down to $24) if you purchase both in tandem. I’ve even created separate pages, one for each purchasing option. Either way, you can get the Guide to Pulp Fiction with just a few mouse clicks. The combo deal is good not only to Guide buyers subscribing to BnT for the first time, but also to former subscribers who’ve not renewed lately and current subscribers who can extend their subs by another four issues. A few years ago, in an exchange with me on the Yahoo group PulpMags, legendary writer, artist, editor and publisher Jim Steranko was kind enough to say: “I recommend everyone get a copy of your book, The Blood ‘n’ Thunder Guide to Collecting Pulps — it’s loaded with the kind of insights that only decades of actual reading could confirm. And it’s superbly written, too. Couldn’t ask for more!” I think Jim will find the Blood ‘n’ Thunder Guide to Pulp Fiction equally to his liking. And I’m willing to bet that other folks who bought the 2007 Guide will feel the same way. I’ve also completed work on the new issue of Blood ‘n’ Thunder (#38, Summer 2013), the latest volume in the “Classic Pulp Reprints” series (J. Allan Dunn’s The Island, a sequel to Barehanded Castaways), and the long-delayed Distressed Damsels and Masked Marauders. The rest is up to my printer.